Step #2 - Once you've determined your ability level, click the button to start reserving your Whistler equipment rental. Step #3 - Pick your gear up before your first day of skiing or riding at one of our 3 Whistler Blackcomb customer service locations. Please note: Whistler lift ticket & gear rental discounts are only available with a confirmed Whistler Condo booking on this site. All rentals must be ordered 4 days prior to arrival. Why Book Your Discount Equipment Rental With Us? Improve Quicker! - Every year, equipment design breakthroughs make skiing/riding more fun. Better equipment can instantly change your ability and even accelerate your ability to improve. Gain Confidence - You will confidently conquer more terrain and see parts of Whistler Blackcomb that were previously unaccessible to you - simply because of your ability restrictions. Save Money - Save on equipment rental and discount Whistler lift tickets when purchased in advance. Save Time - Order from the comfort of your home and get express service in the pick locations as a pre-confirmed customer. Lighten your Load - Don't lug your OLD gear around the airports of the world. In fact, when you book online, you don't even have to lug your rented stuff around the resort. Book online and you get free overnight storage at your pick-up location, not to mention less luggage to carry around the world! With more than 5 business days before your specified ticket pick-up date, please send us an emailwith your refund request and reasoning. If you are injured or ill, and accompany your refund request with a valid doctor's note. Please note: We are not responsible for currency exchange rate fluctuations at the time of refund. Refunds may take up to 4 weeks to process and are subject to a 5% administrative fee. No refunds will be issued after April 30th of the current ski season. You can purchase damage protection for $5.00 per day and start relaxing. This covers any base damage incurred due to rock or other obstacles. This does not cover theft. We recommend you use the overnight storage at the shop, which is free for all pre-booked rentals. Your personal information will not be shared with anyone other than the intended rental shop. We take your privacy seriously. The ski/snowboard is specially designed to rapidly increase the learning curve of the new athlete to the sport. With the shorter lengths and hourglass shape, the ski/snowboard performs with minimal effort. Intermediate skiers/riders should usually choose to rent high performance gear. When selecting your gear in the shop, specify if you enjoy groomed moderately challenging slopes or, if you are more of an enthusiast who ventures off the groomed slopes and into moguls, chopped up powder etc. The Whistler Blackcomb rental shop staff will make sure you're set up with appropriate gear. Expert Skiers/Riders who enjoy the off piste and steep slopes can choose the ski/board best suited for their style. 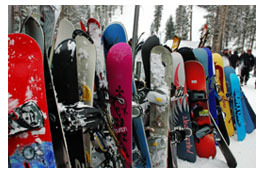 Skis/Board are designed in such a way that the renter can compliment their technique by the equipment they choose. Someone who enjoys the speed/racing skill of skiing will be inclined to choose a ski/board that is torsionally stiffer and has less side cut. On the contrary, someone who likes the short radius type turn will choose a softer more forgiving ski/board that has a wider side cut. Finally, after the big dumps of snow, there is the fat ski -- an all around wider ski which resembles a water-ski. This ski floats on the top of powder making it much easier to master the steep and deep. Choose a rental equipment shop closest to your accommodations. This location is in Essentially Blackcomb in the Carleton Lodge (next to the Longhorn Saloon and Grill), at the base of Whistler Mountain, directly across from the Whistler Mountain gondola. Inside Essentially Blackcomb, look for the Pre-Registered Ski & Snowboard School Desk and AlluraDirect.com sign. Choose this location if you are staying in Village North, Whistler Village, in the Upper Village on the Whistler Mountain Side or have enrolled for ski/board school on Whistler Mountain. This location is on the Main Floor of the Blackcomb Day Lodge beside the Wizard Grill. Look for the Pre-Registered Ski & Snowboard School Desk and AlluraDirect.com sign above the desk. Choose this location if you are staying in the Upper Village on the Blackcomb side, on the slopes of Blackcomb, or at the Blackcomb Base or if you have enrolled your kids on Blackcomb Mountain. If you're heading away from the gondola, this location is just across the pedestrian bridge on the left. The desk is located in the centre of the shop. Look for the Pre-Registered Ski & Snowboard School Desk and AlluraDirect.com sign. Choose this location if you are staying in the Whistler Creekside area or South of the main village. Need More Discount Whistler BC Lift Ticket, Gear Rental or Accommodation Help? You get personal help by phone or email with Whistler lift tickets, accommodation reservations and any other issue we can help you with (we will try our hardest! ), 7 days per week! Thanks for using our Whistler Canada Discount Equipment Rental Store!